It is the last day of the Year of the Horse today. The Chinese New Year's Eve marks the beginning of the Spring Festival, which traditionally runs from this last day of the last month of the lunar calendar to the Lantern Festival on the 15th day of the first month. It is a public holiday in many places with ethnic Chinese populations such as Taiwan, Singapore and Malaysia where celebrations are already underway due to the time difference. 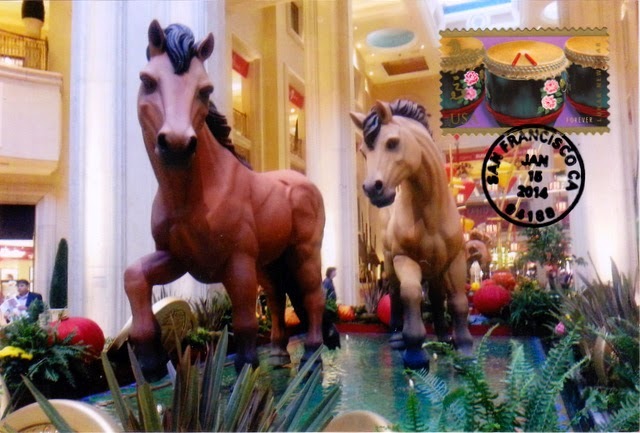 Outgoing postcard US-3224033 to Taiwan was a maxi card showing a pair of horses, part the "Year of the Horse" art installation at The Palazzo's Waterfall Atrium and Gardens in 2014, with a commemorative the Year of the Horse Forever stamp and a bullseye postmark.